A fever is any body temperature elevation over 100.4°F (38°C). A healthy person's body temperature fluctuates between 97°F (36.1°C) and 100°F (37.8°C), with the average being 98.6°F (37°C). The body maintains stability within this range by balancing the heat produced by the metabolism with the heat lost to the environment. The "thermostat" that controls this process is located in the hypothalamus, a small structure located deep within the brain. The nervous system constantly relays information about the body's temperature to the thermostat, which in turn activates different physical responses designed to cool or warm the body, depending on the circumstances. These responses include: decreasing or increasing the flow of blood from the body's core, where it is warmed, to the surface, where it is cooled; slowing down or speeding up the rate at which the body turns food into energy (metabolic rate); inducing shivering, which generates heat through muscle contraction; and inducing sweating, which cools the body through evaporation. A fever occurs when the thermostat resets at a higher temperature, primarily in response to an infection. To reach the higher temperature, the body moves blood to the warmer interior, increases the metabolic rate, and induces shivering. The chills that often accompany a fever are caused by the movement of blood to the body's core, leaving the surface and extremities cold. Once the higher temperature is achieved, the shivering and chills stop. When the infection has been overcome or drugs such as aspirin or acetaminophen have been taken, the thermostat resets to normal and the body's cooling mechanisms switch on: the blood moves to the surface and sweating occurs. Fever is an important component of the immune response, though its role is not completely understood. Physicians believe that an elevated body temperature has several effects. The immune system chemicals that react with the fever-inducing agent and trigger the resetting of the thermostat also increase the production of cells that fight off the invading bacteria or viruses. Higher temperatures also inhibit the growth of some bacteria, while at the same time speeding up the chemical reactions that help the body's cells repair themselves. In addition, the increased heart rate that may accompany the changes in blood circulation also speeds the arrival of white blood cells to the sites of infection. Fevers are components of many disease entities. Virtually all persons experience fevers at some time in their lives. Elevations in temperature are not reportable events. Thus, accurate data regarding the prevalence of fevers are not available. Fevers are primarily caused by viral or bacterial infections, such as pneumonia or influenza . However, other conditions can induce a fever, including allergic reactions; autoimmune diseases; trauma, such as breaking a bone; cancer ; excessive exposure to the sun; intense exercise ; hormonal imbalances; certain drugs; and damage to the hypothalamus. When an infection occurs, fever-inducing agents called pyrogens are released, either by the body's immune system or by the invading cells themselves that trigger the resetting of the thermostat. In other circumstances, the immune system may overreact (allergic reactions) or become damaged (autoimmune diseases), causing the uncontrolled release of pyrogens. A stroke or tumor can damage the hypothalamus, causing the body's thermostat to malfunction. Excessive exposure to the sun or intense exercise in hot weather can result in heat stroke, a condition in which the body's cooling mechanisms fail. Malignant hyperthermia is a rare, inherited condition in which a person develops a very high fever when given certain anesthetics or muscle relaxants in preparation for surgery. How long a fever lasts and how high it may go depends on several factors, including its cause, the age of the person, and his or her overall health. Most fevers caused by infections are acute, appearing suddenly and then dissipating as the immune system defeats the infectious agent. An infectious fever may also rise and fall throughout the day, reaching its peek in the late afternoon or early evening. A low-grade fever that lasts for several weeks is associated with autoimmune diseases such as lupus or with some cancers, particularly leukemia and lymphoma. A doctor or other healthcare provider should be called when a fever does not resolve after two to three days. Anyone with a fever over 104°F (40.0°C) should seek immediate medical treatment. A doctor should be called when an infant's temperature rises above 100°F (37.8°C) and cannot be brought down within a few minutes. Infants whose temperatures exceed 102°F (38.9°C) should be immersed in warm or tepid water to help reduce temperature slowly, while waiting for emergency help to arrive. A fever is usually diagnosed using a thermometer. A variety of different thermometers are available. Glass thermometer should not be used since they can break and release mercury, which is toxic. Digital thermometers can and should be used in place of glass thermometers rectally, orally, and under the arm in all age groups. 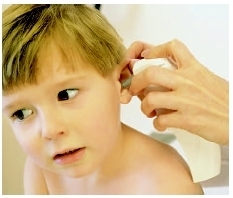 Electronic thermometers can be inserted in the ear to quickly register the body's temperature. As important as registering a person's temperature is determining the underlying cause of the fever. The presence or absence of accompanying symptoms, a person's medical history, and information about what he or she may have ingested, any recent trips taken, or possible exposures to illness all help the physician make a diagnosis. Blood tests can aid in identifying an infectious agent by detecting the presence of antibodies against it or providing samples for growth of the organism in a culture. Blood tests can provide the doctor with white blood cell counts. Ultrasound tests, magnetic resonance imaging (MRI) tests, or computed tomography (CT) scans may be ordered if the doctor cannot readily determine the cause of a fever. An ear thermometer is used to measure body temperature through the ear canal. usually should be allowed to run its course. Drugs to lower fever (antipyretics) can be given if a person (particularly a child) is uncomfortable. These include acetaminophen and ibuprofen. Aspirin, however, should not be given to a child or adolescent with a fever since this drug has been linked to an increased risk of Reye's syndrome . Bathing a person in tepid water can also help alleviate a high fever. A very high fever in a small child can trigger seizures ( febrile seizures ) and, therefore, should be treated immediately. A fever accompanied by the above symptoms can indicate the presence of a serious infection, such as meningitis , and should be brought to the immediate attention of a physician. Antipyretic drug —Medications, like aspirin or acetaminophen, that lower fever. Febrile seizure —Convulsions brought on by fever. Hyperthermia —Body temperature that is much higher than normal (i.e. higher than 98.6°F). Malignant hyperthermia —A type of reaction (probably with a genetic origin) that can occur during general anesthesia and in which the patient experiences a high fever, muscle rigidity, and irregular heart rate and blood pressure. Metabolism —The sum of all chemical reactions that occur in the body resulting in growth, transformation of foodstuffs into energy, waste elimination, and other bodily functions. These include processes that break down substances to yield energy and processes that build up other substances necessary for life. Pyrogen —A chemical circulating in the blood that causes a rise in body temperature. Most fevers caused by infection end as soon as the immune system rids the body of the pathogen, and these fevers do not produce lasting effects. The prognosis for fevers associated with more chronic conditions, such as autoimmune disease, depends upon the overall outcome of the disorder. Fevers may be prevented by avoiding the various diseases that cause them. Adequate nutrition via a well-balanced diet and sufficient intake of liquid help to reduce many fevers. Adequate intake of electrolytes such as sodium, chloride, potassium, phosphate, and bicarbonate helps to prevent dehydration that often accompanies a fever. Parents should carefully monitor their infants and young children for symptoms of fever. Any fever that exceeds 103°F (39.4°C) for more than a few minutes should be promptly treated. Barlam, Tamar F., and Dennis L. Kasper. "Approach to the Acutely Ill Infected Febrile Patient." In Harrison's Principles of Internal Medicine , 15th ed. Edited by Eugene Braunwald et al. New York: McGraw-Hill, 2001, pp. 95–101. Beutler, Bruce, and Steven M. Beutler. "The Pathogenesis of Fever." In Cecil Textbook of Medicine , 22nd ed. Edited by Lee Goldman et al. Philadelphia: Saunders, 2003, pp. 1730–32. Bisno, Alan L. "Rheumatic Fever." In Cecil Textbook of Medicine , 22nd ed. Edited by Lee Goldman et al. Philadelphia: Saunders, 2003, pp. 1788–93. Dale, David C. "The Febrile Patient." In Cecil Textbook of Medicine , 22nd ed. Edited by Lee Goldman et al. Philadelphia: Saunders, 2003, pp. 1729–30. Dinarello, Charles A., and Jeffrey A. Gelfand. "Fever and Hyperthermia." In Harrison's Principles of Internal Medicine , 15th ed. Edited by Eugene Braunwald et al. New York: McGraw-Hill, 2001, pp. 91–4. Dumler, J. Stephen. "Q Fever (Coxiella burnetii)." In Nelson Textbook of Pediatrics , 17th ed. Edited by Richard E. Behrman et al. Philadelphia: Saunders, 2003, pp. 1009–10. ——. "Spotted Fever Group Rickettsioses." In Nelson Textbook of Pediatrics , 17th ed. Edited by Richard E. Behrman et al. Philadelphia: Saunders, 2003, pp. 999–1003. Halstead, Scott B. "Yellow Fever." In Nelson Textbook of Pediatrics , 17th ed. Edited by Richard E. Behrman et al. Philadelphia: Saunders, 2003, pp. 1095–6. ——. "Dengue Fever and Dengue Hemorrhagic Fever." In Nelson Textbook of Pediatrics , 17th ed. Edited by Richard E. Behrman et al. Philadelphia: Saunders, 2003, pp. 1092–4. Kaye, Elaine T., and Kenneth M. Kaye. "Fever and Rash." In Harrison's Principles of Internal Medicine , 15th ed. Edited by Eugene Braunwald et al. New York: McGraw-Hill, 2001, pp. 95–101. Powell, Keith R. "Fever without a Focus." In Nelson Textbook of Pediatrics , 17th ed. Edited by Richard E. Behrman et al. Philadelphia: Saunders, 2003, pp. 841–5. ——. "Fever." In Nelson Textbook of Pediatrics , 17th ed. Edited by Richard E. Behrman et al. Philadelphia: Saunders, 2003, pp. 839–40. Dinarello, C. A. "Infection, fever, and exogenous and endogenous pyrogens: some concepts have changed." Journal of Endotoxin Research 10, no. 4 (2004): 201–22. Galache, C., et al. "Q fever: a new cause of 'doughnut' granulomatous lobular panniculitis." British Journal of Dermatology 151, no. 3 (2004): 685–7. Huang, S. Y., et al. "Effect of Recent Antipyretic Use on Measured Fever in the Pediatric Emergency Department." Archives of Pediatric and Adolescent Medicone 158, no. 10 (2004): 972–6. American Academy of Emergency Medicine. 611 East Wells St., Milwaukee, WI 53202. Web site: http://www.aaem.org/. American Association of Naturopathic Physicians. 8201 Greensboro Drive, Suite 300, McLean, VA 22102. Web site: http://naturopathic.org/. American Society of Clinical Pathologists. 2100 West Harrison Street, Chicago IL 60612. Web site: http://www.ascp.org/index.asp. College of American Pathologists. 325 Waukegan Road, Northfield, IL 60093. Web site: http://www.cap.org/. Meningitis Foundation of America Inc. 7155 Shadeland Station, Suite 190, Indianapolis, IN 46256–3922. Web site: http://www.musa.org/default.htm. "Fever." MedlinePlus. Available online at http://www.nlm.nih.gov/medlineplus/ency/article/003090.htm (accessed January 6, 2005). "Typhoid Fever." Centers for Disease Control and Prevention. Available online at http://www.cdc.gov/ncidod/dbmd/diseaseinfo/typhoidfever_g.htm (accessed January 6, 2005). "Yellow Fever." Centers for Disease Control and Prevention. Available online at http://www.cdc.gov/travel/diseases/yellowfever.htm (accessed January 6, 2005). "Yellow Fever." World Health Organization. Available online at http://www.who.int/csr/disease/yellowfev/en/ (accessed January 6, 2005).